6.30pm – 7.30pm Recital featuring excerpts from the Hessisches Staatstheater repertoire. 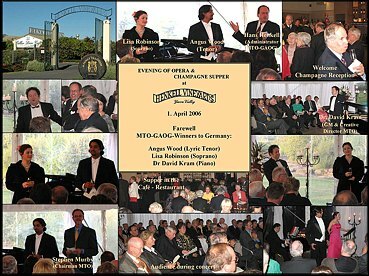 A preview of the German Australian Opera Fest on 29 October 2006. 7.30pm – 8.30pm Supper with Wines of the Vineyard. In this early phase the German-Australian Opera Grant and the Hessisches Staatstheater Wiesbaden wishes to encourage all Sponsors, Benefactors and their friends to attend the German-Australian Opera Fest in Germany, but also become hosts themselves by inviting their clients, associates or friends to this unique German-Australian cultural and business platform.